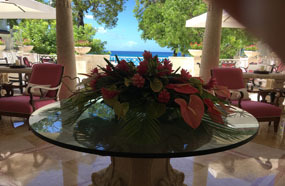 Sandy Lane’s legendary style makes it one of the most prestigious resorts in the world. 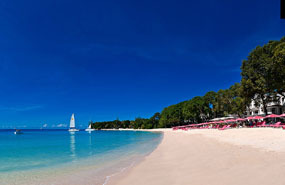 It is set within 22 acres of manicure gardens, private properties and The Green Monkey Golf course.Sandy Lane has it all: a perfect location in Barbados for a luxury Caribbean holiday, overlooking the Caribbean Sea on a tranquil coral sand beach, shaded by mature mahogany trees, the timeless and classic elegance of the Palladian buildings mirrored in the spacious comfort of the 113 hotel rooms and suites, a stunning private villa, exceptional golf, gourmet dining, an outstanding spa, superb sports facilities and finally, an exceptional level of warm Barbadian hospitality. We stayed in a beautiful ground floor ocean view room in the Turtle wing (room 109).The room had everything you could wish for including a unpacking/ packing service.The shower had amazing jets, the linen was very luxurious and the bed so comfortable. You could access the beach within 10 steps with a very short walk to the bar and restaurants. 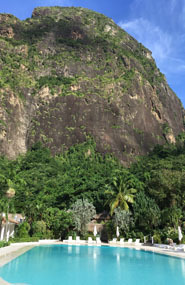 There are varieties of places to eat including Bagan Blue for breakfast , and evening meal , Open for the evening L Acajou a fine dining Restaurant is the place to go. All the food was delicious, breakfast was a fabulous start to the day with everything imaginable on the menu and table service. 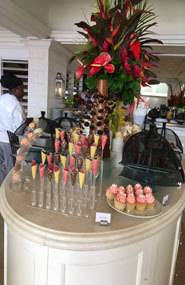 The famous Sandy Lane Sunday Brunch and Tuesday Buffet is worth a visit although it is approx. £90 pp so make sure you are hungry. 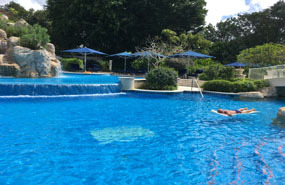 The split level swimming pool and Spa are at the back of the hotel and this is a great area to relax with lots of space to enjoy the early morning sun on the most comfortable loungers I’ve ever lay on with 8 inch padded cushions . There are foam LIlos to float around on in the pool and the Resort even provides sun cream and games in case you have forgotten yours. 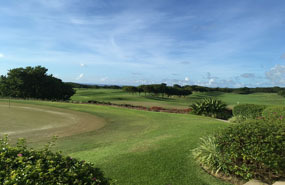 The Green Monkey Golf Course is for guests of the hotel only and if you play I would highly recommend a game regardless of your skill level. The course is carved into rock to create stunning views .There are limited tee times so the course is never busy. This is not millionaire’s golf it is billionaire’s golf. Well worth a visit for sunset drinks on the patio. 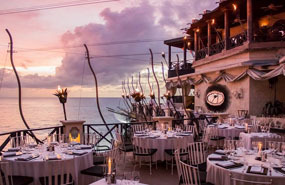 Barbados has an extremely English vibe with lots of bars and restaurants. You drive on the same side as the UK .We had outstanding meals at The Cliff, Cin Cin and Lonestar which I highly recommend. The Cliff restaurant as the name suggest is built within the cliff and the setting is simply stunning . I would advise booking and request an outside edge table. 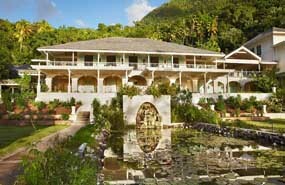 Sandy Lane is a one off and the hot spot for celebrities. All the rooms are individually spacious wooden white plantation style villas hidden within the mountains and jungle. We were very lucky to have a villa with fantastic open views out to sea but some are set within the rain forest. 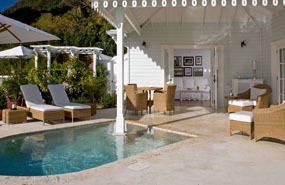 We had a huge patio area with plunge pool, separate lounge and large bathroom. The most comfortable bed I have ever slept in , they even have a pillow menu. The places to eat were the elegant fine dining Great Room , Terrace Restaurant which served breakfast, afternoon tea and in the high season evening meals ,The Cane Bar which has a modern vibe and serves Japanese inspired food ,the Bayside Restaurant for Lunch , dinner and Beach BBQ. During the day there is a Tapas style bar near the beach and an extensive menu bought to your sun lounger. 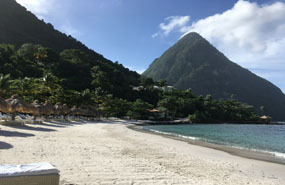 The beach is a wide bay with clear green water due to the reflection of the mountains. 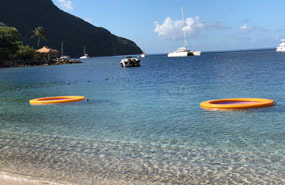 They have four large “paddling pool “rings in the sea that you can sit whilst sipping a delicious cocktail in the sun. They are boats that will take you out for a sunset cruise, visiting bat caves, Rodney bay etc. There is a very large swimming pool with twin bedded sun loungers. There is a jungle spa and a jungle walk. On arrival you are given two small mobile phones so you can communicate with your butler 24/7. You travel around the Resort in Tuk Tuks or small vans and .This service was extremely punctual. 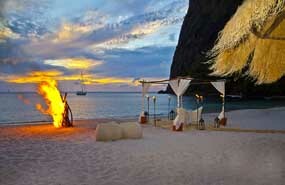 We stayed here on an All Inclusive basis, which I would recommend. The service was exceptional as was the food. While we were here the tennis star Juan Martin del Potro was staying with his family .Matt Damon hires the whole hotel when he married here. On both Islands, Rum is the local drink. There are trips to the distillery’s which are very popular. A local breakfast dish is Coco Tea and Johnny Cakes which are like crunchy doughnuts.